Canary is the common name for the small passerine bird Serinus canaria in the finch family, Fringillidae, which has been long been popular as a cage bird. Canaries are native to the Canary Islands, Azores, and Madeira (Clement et al. 1993; Snow and Perrins 1998). In the wild, this bird is sometimes known as the island canary, wild canary, or Atlantic canary. 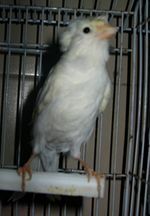 Serinus canaria is often kept as a pet. While wild birds are typically green, yellowish green, or gray, the domesticated canaries have a variety of colors, with the yellow particularly well known. Domesticated birds have escaped from captivity and have established feral populations on Bermuda, Midway Atoll in Hawaii, and Puerto Rico (Clement et al. 1993). In addition to being prized as pets and exhibited because of their beauty and song, canaries have also served a critical role as "miner's canaries," acting as an early warning system for the detection of poisonous but odorless carbon monoxide in coal mines. They have also been used extensively as model organisms in research. These values offered by canaries to humans has resulted in their own advancement and survival as a species, having expanded well beyond the limited borders of their native habitat. The bird is named after the Canary Islands, not the other way around. The color canary yellow is in turn named after the yellow domestic canary. Canaries are passerine birds; that is, members of the order Passeriformes, the largest order of birds, containing more than half of all bird species. Passerines or passeriforms are also known as perching birds or, less accurately, as songbirds (which actually compose a suborder of Passeriformes). The foot of a passerine is specialized for holding onto a branch, with three toes directed forward without any webbing or joining, and one toe directed backward. The hind toe joins the leg at the same level as the front toes. In other orders of birds, the toe arrangement is different. Passerines generally have sharp, curved claws. The order typically is divided into two suborders, Tyranni (suboscines), and Passeri (oscines). Canaries, as finches, are members of the Passeri suborder. A bird that belongs to the Passeri suborder can be called a songbird or oscine. These include about four thousand species. In the oscines, the vocal organ is developed in such a way as to produce various sound notes, commonly known as a bird song. Oscines have the most control of their syrinx muscles among birds, producing a wide range of songs and other vocalizations. In addition to finches, song birds include lyrebirds, blackbirds, jays, larks, sparrows, warblers, wrens, starlings, and cowbirds. Canaries are further classified in the finch family, Fringillidae. Classic or true finches are small to moderately large birds and have strong, stubby beaks, which in some species can be quite large. All have 12 tail feathers and 9 primaries. They have a bouncing flight, alternating bouts of flapping with gliding on closed wings, and most sing well. Their nests are basket-shaped and built in trees. Adult canaries are small birds, about 12.5 centimeters long, with a wingspan of 20-23 centimeters and a weight of 15-20 grams. In the wild, the bird is typically gray, green, or yellow-green, with brownish streaking on its back. It is about 10 percent larger, longer, and less contrasted than its relative the serin, and has more gray and brown in its plumage and relatively shorter wings. The song is a silvery twittering similar to the songs of the serin and citril finch (Clement et al. 1993; Snow and Perrins 1998). In the wild, its habitat is semi-open areas such as orchards and copses, where it nests in shrubs or trees, from sea level up to 1,700 m altitude (Clement et al. 1993; Snow and Perrins 1998; Hagemeijer and Blair 1997). The wild canary is largely sedentary, though some small inter-island movements do occur between the islands within each island group. Within the Canary Islands, it is largely confined to the western islands (Gran Canaria westward), though a small population has colonized Lanzarote since 1985, and small numbers also now occur on Fuerteventura (Snow and Perrins 1998). The Canary Islands' name, which gave rise to the name of the bird, is likely derived from the Latin term Insula Canaria, meaning Island of the Dogs, a name applied originally only to the island of Gran Canaria. It is thought that the dense population of an endemic breed of large and fierce dogs, like the Presa Canario, was the characteristic that most struck the few ancient Romans who established contact with the islands by the sea. Canaries were first bred in captivity in the 1600s. They were brought over from their native islands by Spanish sailors to Europe. Monks started breeding them and only sold the males (which sing). This kept the birds in short supply and drove the price up. Eventually, Italians obtained hens and were able to breed the birds themselves. The bird became increasingly popular and resulted in many breeds arising and the birds being bred all over Europe. The same occurred in England. First the birds were only owned by the rich but eventually the local citizens started to breed them and, again, they became very popular. Many breeds arose through selective breeding. Canaries can be divided into three main groups. Colorbred canaries are bred for their many color mutations. These varieties include Ino, Eumo, Satinette, Bronze, Ivory, Onyx, Mosaic, Brown, and so forth. 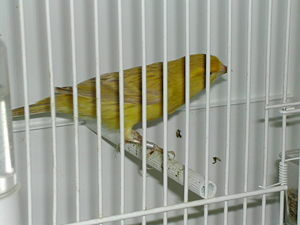 Type canaries are bred for their shape and conformation. These include Border, Fife, Gloster, Gibber Italicus, Raza Española, Berner, Lancashire, Yorkshire, Norwich, and so forth. Song canaries are bred for their unique and specific song patterns and include Spanish Timbrado, Roller, Waterslager (also known as "Malinois"), American Singer, Russian Singer, and Persian Singer). Canaries are judged in competitions and there are many canary bird shows all over the world. The world show (C.O.M.) is held in Europe each year and attracts thousands of breeders. As many as 20,000 birds are brought for competition. In addition to being popular for show and as pets, canaries have provided concrete benefit to humans working in mines or doing research. Miner's canaries were used as an early form of warning system for the detection of poisonous but odorless carbon monoxide in mines. They were once regularly used in coal mining for this purpose. Three or more canaries (or other small birds with high metabolism) were taken down new shafts, and if one or more exhibited abnormal behavior, the parties determined that the shaft was unsafe. Toxic gases such as carbon monoxide and methane in the mine would kill the bird before affecting the miners. Because canaries tend to sing much of the time, they provided both a visual and audible cue in this respect. The use of so called miner's canaries in British mines was still being used as recently as 1986 before being phased out (BBC 1996). By analogy, the term climate canary is used to refer to a species that is affected by an environmental danger prior to other species, thus serving as an early warning system for the other species with regard to the danger. Canaries have been extensively used in research to study neurogenesis, or the birth of new neurons in the adult brain, and also for basic research in order to understand how songbirds encode and produce song. Thus, canaries have served as model species for discovering how the vertebrate brain learns, consolidates memories, and produces coordinated motor movements. British Broadcasting Corporation (BBC). 1986. Coal mine canaries made redundant. BBC December 30, 1996. Retrieved December 12, 2007. Clement, P., A. Harris, and J. Davis. 1993. Finches and Sparrows. London: Christopher Helm. ISBN 0713680172. Hagemeijer, W., and M. J. Blair. 1997. The EBCC Atlas of European Breeding Birds: Their Distribution and Abundance. T & A D Poyser. ISBN 0856610917. Miley-Russell, M. 2005. The Practical Canary Handbook: Breeding & Keeping Canaries. S.l. : Booklocker.com. ISBN 1591138515. Snow, D. W., and C. M. Perrins. 1998. The Birds of the Western Palearctic. New York: Oxford University Press. ISBN 019854099X. This page was last modified on 2 April 2008, at 04:02.